PICS: Why are critics calling the R6.4bn Jesus painting fake? Cape Town - Many who are tempted to begin collecting art, or who are expanding existing collections, want to know how to "read" the art market, says Ruarc Peffers, director at Aspire Art Auctions. When they invest money in an art collection, the key question often is: Will my art appreciate in value over time? "Of course, art is not an asset class in the same sense as stocks or bonds. Returns on investment are never a straightforward proposition, and most collectors do it for the passion and love of the art rather than for financial gain," says Peffers. "But a closer look at how value is created and has grown in the art market in recent times reveals some interesting trends. Though reports differ, according to Barron’s, the global art market was worth $63.7bn (R801bn) in 2017, up after a two-year decline." While, according to TEFAF (The European Fine Art Foundation), the African art market in its entirety represents no more than 1% of global market value, despite African artists being responsible for more than 20% of the work offered through global auction houses. The South African market, however, punches well above its weight, and is responsible for some of the top contemporary art produced and traded globally – including in major art centres like London and New York, says Peffers. According to the Africa Art Market Report, as of 2017, 10 of the top 20 modern artists (born between 1850 and 1939) and seven of the top 20 contemporary artists (born after 1940) are South African. This assessment is judged by the artist’s value at auction and the number of exhibitions in museums and commercial galleries. Several examples demonstrate the value that South African modern and contemporary art is realising in the current market. 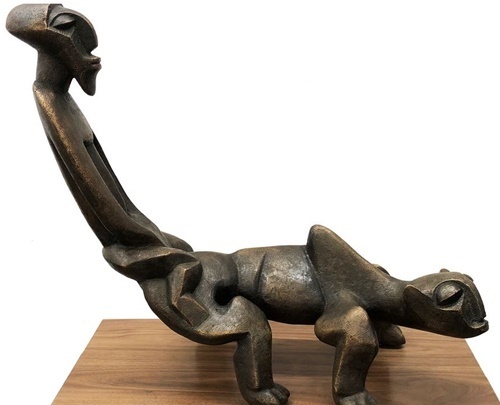 In a recent sale at Aspire Art Auctions in Johannesburg, a sculpture by Sydney Kumalo, titled Mythological Rider (1970), estimated between R700 000 to R1m, sold for R1 932 560 in November 2017. "Kumalo was a leading light of the Amadlozi Group of modern sculptors. The appreciation in value is because of changes in the way these artists have been represented, and a diversification of the market that was largely pioneered by Aspire," says Peffers. "This work was also purchased by a black collector, which is indicative of a new understanding and appreciation of South Africa’s traditional art history." A comparable work – similar sized, also bronze and from an edition the same size – by Kumalo, Ndebele Reclining Figure, sold in 2007, fetched R155 960 – representing a 1 200% increase in the artist’s value over the decade. "In areas of the art market where value has traditionally resided, such as with work by J.H. Pierneef, the same growth pertains. Fifteen years ago, a Pierneef print would have sold for between R1 000 and R5 000. Aspire recently sold a rare self-portrait linocut by the artist for R47 746, in March 2018. Again, this represents an increase in value of approximately 1 000% over the period," says Peffers. An interesting example for him is the recent sale by Aspire of the largest painting ever produced by the respected artist Robert Hodgins. His Night of the Awards, an oil on canvas painting from 1998, sold for over R2m in March 2018, despite a tough economic climate. At just under two metres high by almost five metres wide, there is a limited market that can accommodate and show a work of this scale and, consequently, results in fewer bidders vying for it. At the other end of the market, Hodgins’ well-known prints were selling at about R1 000 to R2 000 ten years ago. Today, they sell closer to the R10 000 to R20 000 range. Assuming they maintain the same trajectory, in 10 years from now, they could be trading at R100 000 each, according to Peffers. "The market is also accommodating growth in other, more challenging conceptual areas. In March 2017, Aspire sold a work by young contemporary artist Mohau Modisakeng, Ditaola XV, for R204 624," he adds. "Modisakeng was the leading light at the 2017 Venice Biennale, showing at the celebrated South African pavilion, which received high-profile international media coverage." One particular South African international "superstar" who is leading the change and diversification in the market is conceptualist and performance artist Athi-Patra Ruga, whose work is represented in major local and international collections including the Louis Vuitton Foundation, and in Cape Town’s Zeitz MOCAA. His staged photograph, Night of the Long Knives III, sold at Aspire’s March 2018 auction for R295 568, just short of double the pre-sale low estimate. "The success of these young contemporary artists at auction indicates the full circle that has turned for previously under-represented artists, between, for example, the Amadlozi generation of the 1960s, and artists like Ruga and Modisakeng," says Peffers. "It’s in this contemporary growth segment that Aspire has a strategic focus, a commitment that extends to the Artist’s Resale Rights royalties that the company pays to living South African artists whose work sells at its auctions." Ultimately, today’s collections and collectors are changing, in his view. "The same people that were buying historic works a decade ago are today buying much more adventurous and challenging works as well. It tells us that fundamentally, art collecting is about what you love and what you want to live with - and that represents its true value," says Peffers.